Joseph Smith, Junior – born 23rd of December 1805 in Sharon, Vermont, USA. At the age of 11 years, the family settled in Palmyra, New York and became members of the Presbyterian Church. In 1820 at the age of 14 years, Smith claimed there was a revival in Palmyra which caused him great concern, as he did not know which church to join. He claims to have gone into a grove near home and prayed to God to show him which “sect” to join. He claimed to have had two personages appear to him, one pointing to the other and saying – "This is my beloved son, hear him." In answer to the question, which church was right, he was told "None of them; they are all wrong and all their creeds are an abomination in my sight." Church records for the area show no such revival. Smith claimed another revelation on 21 September 1823 in which an angel, named Moroni, had been sent from God to reveal a book written on golden plates giving an historical account of the history of the American people and the fullness of the Gospel. Smith said he was given the Urim and Thummin to translate this book. (Nowhere were these articles used to translate in scripture but only in determining God's will in judicial matters). The 116 pages of this initial translation was lost when one of Smith's followers took them home to prove to his wife the fruits of his labours during long absences from home. What the Mormons now have as the book of Mormon really starts on page 117. What was the message, the fullness of the Gospel? Smith was refused permission by the father of Emma Hale to marry her and they eloped. They married on 18 January 1827. Smith was seen digging for money with the help of a peep stone, which he placed in his hat and looked into the stone, to find the location of buried treasure. Smith was convicted and described in court records as "Joseph Smith, the glass looker." He left the county as an alternative to jail. In 1830 the book of Mormon was published and the same year he organized a church in New York State. Today they are known as "Church of Jesus Christ of Latter Day Saints" and "Re-organized church of Jesus Christ of Latter Day Saints." They are now one of the fastest growing churches in the world with well over 15.8 million members in 2016 and boasting 75,000 full time missionaries. Yet, the last years growth has been the lowest since 1937 at 1.59% annual growth. Early Mormons were encouraged to marry Indian woman so that a Mormon prophecy could be fulfilled, that said "The Indians would become a white and delightsome people." Smith also founded a banking company and made three dollar bills, Hence the saying phoney as a three dollar bill. Because of their polygamist doctrine and relationships, Smith and his followers were in constant strife with settlers and moved further west. After his death, it was discovered Smith had been involved in over 200 marriages in temple rites. After settling in Nauvoo, a newspaper, the Nauvoo Expositor, an anti-Mormon paper, published unfavourable material about the Mormons. Smith ordered his men to destroy the press and burn every paper. Smith was arrested, released, then re-arrested along with his brother Hyrum and put in jail in Carthage. On June 27, 1844, a mob attacked the jail and a gunfight ensued, Smith killing two men with a smuggled pistol and he and his brother were then killed. Hardly the death of a martyr, but he become one nevertheless. Great emphasis was placed on prophecy and the test of a prophet applies to Deut. 18.20–22. Smith claimed to be able to see anything he asked the father to show him and in one incident "a young woman's Journal" published in Salt Lake City in 1892, part of Joseph Smith's writings appeared in an article called "The inhabitants of the moon: the inhabitants of the moon are more of a uniform size than the inhabitants of the earth, being about 6 feet in height. They dress very much like the Quaker style and are quite general in style of the fashion of dress. They lived to be very old, coming generally near 1000 years." Brigham Young, Smith's successor, in his “Journal of Discourses" said "who can tell us of the inhabitants of this little planet that shines of an evening, called the moon. When you inquire about the inhabitants of that sphere, you find the most learned men are as ignorant in regards to them, as the most ignorant are to their fellows. So it is in regard to the inhabitants of the sun. Do you think it is inhabited? I rather think that it is. Do you think there's any life there? No question of it!" Joseph Smith also claimed the North Pole was inhabited, saying it was a "warm Fruitful country inhabited by the 10 tribes of Israel; a country divided by a river, on one side of which lives the half tribe of Manasseh which is more numerous than all the others." Only Mormons will go to Heaven. Joseph Smith "God will make me to be God to you in his stead." The book of Mormon is God's latest revelation. Equal with the Bible. Jesus did not exist before his birth on earth, was polygamously married to Mary, Martha and Mary Magdalene. 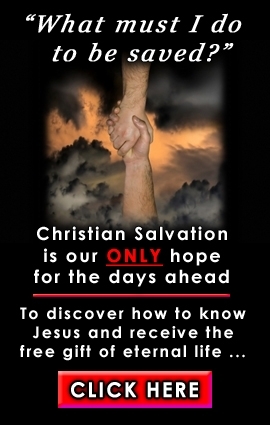 A person can earn salvation by works. The Mormon priesthood is the kingdom of God. To disobey them is disobeying God. Only by total immersion Baptism can sins be forgiven. A loved one who has died a non-Mormon can be saved into heaven if a Mormon stands in for them and gets proxy baptised. A man will retain his wives and have children in heaven. Though polygamy was introduced by divine revelation it was banned after government pressure. Past leaders held that Negroes were inferior and under God's curse and were not allowed to become priests. This has since changed. Before Christ returns to reign a thousand years, Mormons will be gathered together and the Jews will return to Jerusalem. During the thousand year reign on this earth Mormons will build temples to remain on earth and be worthy of a second chance. Everyone will live to be 100 in this time then be suddenly immortalized. At the end of 1000 years there will be a second resurrection and all will be judged. Those worthy of the highest grade of salvation will live on the new earth, the others put elsewhere. The third of rebellious angels and the worst humans will spend eternity in hell. "This book must either be true or false. If true, it is one of the most important messages sent from God to man, affecting both the temporal and eternal interests of every people under heaven to the same extent in the same degree that the message of Noah affected the inhabitants of the old world. If false, it is one of the most cunning, wicked, bold, deep laid impositions ever palmed upon the world; calculated to deceive and ruin millions who will sincerely receive it as the word of God and will suppose themselves securely built upon the rock of truth until they are plunged with their families into hopeless despair. The nature of the message in the book of Mormon is such that, if true, no one can possibly be saved and reject it, if false, no one can possibly be saved and receive it. Therefore every soul in all the world is equally interested in ascertaining its truth or falsity. If after rigid examination, it is found to be an imposition, it should be extensively published to the world as such. The evidence and arguments upon which the imposture was detected should be clearly and logically stated, that those who have been sincerely, yet unfortunately deceived, may perceive the nature of the deception and be reclaimed and those who continue to publish the delusion maybe exposed and silenced, not by physical force but by strong and powerful arguments – by evidences adduced from scripture and reason." From introduction to The Divine Authenticity of The Book of Mormon. So, we are invited by the Mormons to prove their beliefs are true or false. Mormon apostle John A. Widstoe, said that Joseph Smith's first vision in 1820 is of importance in his history. Upon its reality rest the truth and value of his subsequent work. Mormonism has at least five different accounts of the first vision, not one in line with the other! Furthermore, if the first vision was foundational to the Mormon church beginning in 1830 and the book of Mormon was printed in 1830, why was the 1820 vision upon which the church was founded not officially given until 1842? Joseph Smith is a false prophet. Deut. 18.18–20. Many of his prophecies never were fulfilled and have since been shown to be utterly false and implausible. In spite of all the irrefutable evidence to the contrary, Mormon apostle A. Pratt says about the Bible "who knows that even one verse of the Bible has escaped pollution so as to convey the same sense now that it did in the original." He was trying to prove that the book of Mormon was inspired, yet hundreds of King James verses have been copied Word for Word in the book of Mormon. Mormon book “Pearl of Great Price” pages 50–54. Account of Joseph Smith's vision of the angel Moroni telling him where to find the gold plates, which was the book of Mormon and also the Urim and Thummin to help translate it. (They were supposed to be a type of divine spectacles). The language written on the plates was supposed to be Reformed Egyptian. After the first 116 pages of the book were lost, an Angel took the glasses back. Even the gold plates were hardly ever present during the so called translation so why bother with the Urim and Thummin and the gold plates at all? Joseph Smith placed his seer stone in his hat and looked into it, Reformed Egyptian hieroglyphics would appear with the English translation underneath. An assistant would write what Joseph Smith saw and if correct, the writing would disappear in the hat and another line would appear. Therefore it was divinely inspired, word for word, with no mistake. It seems strange that Reformed Egyptian was not known to man until Joseph Smith, yet whole passages were copied Word for Word from the King James Version of 1611! Also for a book 100% correct, Joseph Smith's successors were so embarrassed by the grammar, 4000 changes have since been made to the original text, the only time the grammar was excellent was where he had copied the King James Version Bible. In 1835 Joseph Smith purchased two Egyptian mummies and a role of papyrus that he claimed was Reformed Egyptian. From it he translated "The book of Abraham" in the "Pearl of Great Price." Many top Egyptologists studied Smith's translations of Abraham's life and proved they were false. The writing was Egyptian and explained the procedures for embalming the dead. The Mormons history centres around the Americas, saying that in 2247 BC, Jaredite's migrated to America from the tower of Babel and were wiped out by internal strife and the sole survivor was the prophet Ether who recorded their history on 24 metallic plates. About 600 BC the two families of Lehi and Ishmael left Jerusalem and landed in South America. Two sons of Lehi; Laman and Nephi fought and divided into two warring camps, the Lamanites and Nephites. The Lamanites were rebellious and cursed by God, their skin being dark and hence the so called origin of the Indians. In AD 421 the Nephites were all killed and only the Lamanites were left when Columbus discovered them in 1492. The commander in chief of the wiped out Nephites was Mormon, who before his defeat, wrote the history on two gold plates and gave them to his son Moroni who hid them in a hill near Palmyra, New York where 1400 years later he appeared as an angel to Joseph Smith in order to help him find the plates. The whole history describes great cities etc. not one has ever been discovered! No truth has ever been confirmed archaeologically. The opposite is generally found, disproving the claims of Mormonism. Scientists have proved the American continents were devoid of domestic animals such as pigs, cattle, horses, asses, etc. until Columbus, yet the book of Mormon claims they were there before Christ. God never asks for blind faith, only Satan does. The Bible is used by archaeologists as an extremely accurate guide – yet none will use the book of Mormon. What does Mormonism say of God and Jesus Christ? "As man is, God once was; as God is, man may be." "Articles of Faith." God was once a man and man may become God or a God. Numbers 23.19, Isaiah 44. 6, Hosea 11:9. Mormons teach that Jesus Christ is a God named Jehovah, a different God from God the Father who known as Elohim. Yet the Bible says in Deuteronomy 6.4 "the Lord (Jehovah) our God (Elohim) is one Lord (Jehovah). Brigham Young, an early Mormon leader, taught that Adam was God. Today the Mormon President, Spencer W. Kimball, calls the Adam – God doctrine, which was taught for 20 years, a false doctrine! To believe Brigham Young was a prophet of God and accept his Adam- God doctrine is to admit the present-day prophet Spencer W Kimball and the Mormon Church is false. To deny the Adam - God doctrine is to deny the prophet who gave it – Brigham Young, to admit he was false. This doctrinal contradiction and finger-pointing proves the Mormons are a false prophet and organization. Brigham Young further said, that Adam was the father of Jesus through relationship with Mary, denying that Christ was born of a virgin. Therefore the Mormon Jesus is not virgin born, is called a spirit brother of Satan, was not God from all eternity, is not one in nature and essence and substance with God the Father and the Holy Spirit. Genesis 2.18–25, 1 Timothy 3. 2. The book of Mormon agrees with the Bible. Mormons believe in having more than one wife. Joseph Smith received this revelation from God on 12 July 1843. He was killed in 1844 but had 48 wives. Joseph Smith was living in adultery long before the revelation of polygamy. Or hell is not eternal but limited. Mormons are actually divided amongst themselves on the doctrine of Hell. Mormons believe baptism is essential for salvation and have baptism by proxy for the dead. They have extensive family tree genealogies. This teaching by them means those who have already died can still be saved. Joseph Smith teaches three heavens or three degrees of glory. Telestial glory where even unbelievers go. Terrestrial glory where good people and religious people go, who are not Mormons. Celestial glory, the third heaven for Mormons only. These teachings are based on one Corinthians 15. 35–54, but this passage speaks of bodies, not heavens. Mormonism is the one true church and all others are an abomination in God's sight. Matthew 16.18 shows Mormonism false or Jesus Christ is false. If Mormonism is true then the gates of hell did prevail against the church. The pre-existence of all men in spirit form. Don't witness to Mormon missionaries. This is like selling a different product to a door-to-door salesman. It takes much time to lead any Mormon to Christ. All of his concepts need to be changed as he believes all that we do by name but not in the same doctrine. Speak with boldness and authority. Any hesitancy is regarded as weakness and error. Take the initiative and steer away from being on the defensive. Challenge them on their concept of God, e.g. do you believe God has a body, father, mother, sisters, brothers, wives? Do you believe as God is man may become? Do you teach that God and Christ are two Gods? Then ask "surely your book of Mormon teaches you what you believe? Show me one verse in this distinctive book that teaches what you believe in God. They will not be able to show you one verse that backs their teachings. Rather the opposite is true, so do not be side tracked here. 2 Nephi 11:7: For if there be no Christ there be no God; and if there be no God we are not, for there could have been no creation. But there is a God, and he is Christ, and he cometh in the fullness of his own time. 2 Nephi 31.21b: And now, behold, this is the doctrine of Christ, and the only and true doctrine of the Father, and of the Son, and of the Holy Ghost, which is one God, without end. Amen. Alma 11.38–39: Now Zeezrom saith again unto him: Is the Son of God the very Eternal Father? The aim in all this is to show them they are lost and in sin. They don't consider themselves to be sinners but people progressing towards godhood. Show that the book of Mormon teaches nothing of their prime doctrine. John 14. 6. The prophet isn't the way nor the Mormon priesthood, nor a new revelation but Jesus Christ! Jeremiah 17.5 is copied exactly into 2 Nephi 28.31. Not even the Catholics trust more in man. Always use the King James Version of the Bible as Mormons discount all other translations. Try to deal with the woman of any married couple first. The woman cannot get into heaven without a Mormon priest to lift her veil on the morning of the resurrection and will fight like a tiger to keep her man in the priesthood.